As someone said, egg is a versatile cooking ingredient, many people who don't eat meat still enjoy eating eggs! 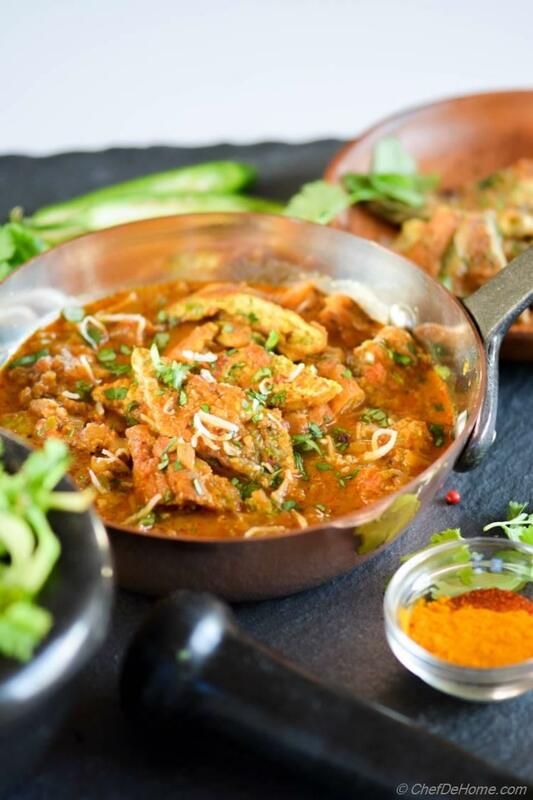 Just like eggs, Egg Curry is one such classic Indian curry which rich or poor, Indian or non-Indian, and even vegetarian "egg-tarians" enjoy all over the world! Sometimes back, Vishal showed me the way he used to eat egg curry with whole hard-boiled eggs fried in spices before adding to the curry. Inspired with gorgeous looking fried eggs, I made Andhra-style egg curry few months back and shared. I know!! Interesting??? Isn't it? However, Indian Omelet is little different from how omelet is eaten everywhere else. It is not that soft, or just set and stuffed with cheese and peppers etc.... instead it has healthy touch of chopped green chilies, onions, cilantro, some spices and it is crisped on both side for that extra oomph! 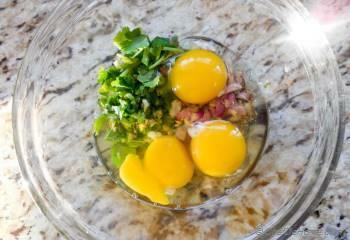 So, this crispy onion and cilantro omelet is serving the egg part in this coconut and spices curry. The crispy egg stands well to the gravy and didn't get soggy! plus it is a great way to use leftover omelet! Do you ever have leftover omelet?? Just asking! 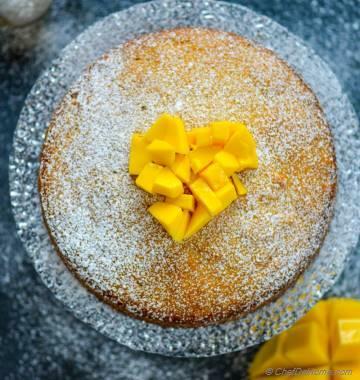 because I never have ;) until I'm hosting a brunch party and no guest happen to (surprisingly!!) like eggs! 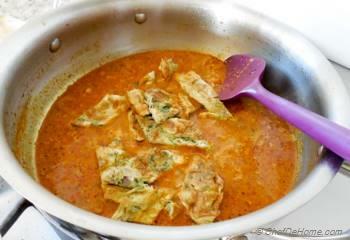 If you don't like omelet, you can always add just simple boiled eggs or fried eggs to the same curry gravy. Ask me!! 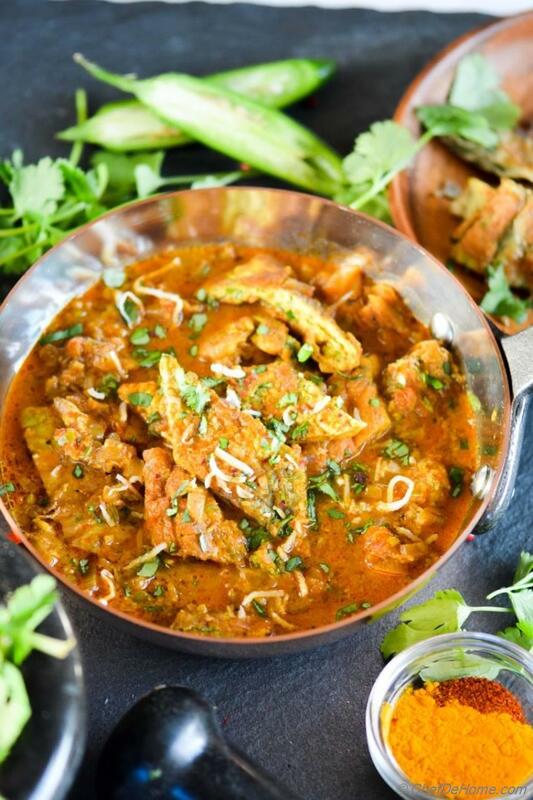 I find this curry so flavorful, even a bowl of lite pan-seared tofu often make it's way in this yummy gravy! completely vegan!! 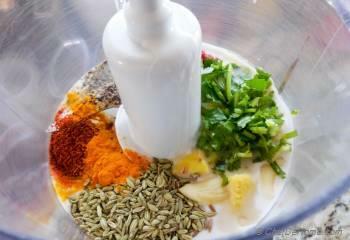 I specially included recipe ingredients for coconut curry paste separately. This curry paste is very versatile. You can use it to make coconut chicken curry. Or just rub chicken with curry paste, some oil, and salt and roast chicken at 375 degree F until done for an easy curry roasted chicken dinner. Oh yes! Good you asked! This curry is gluten free. 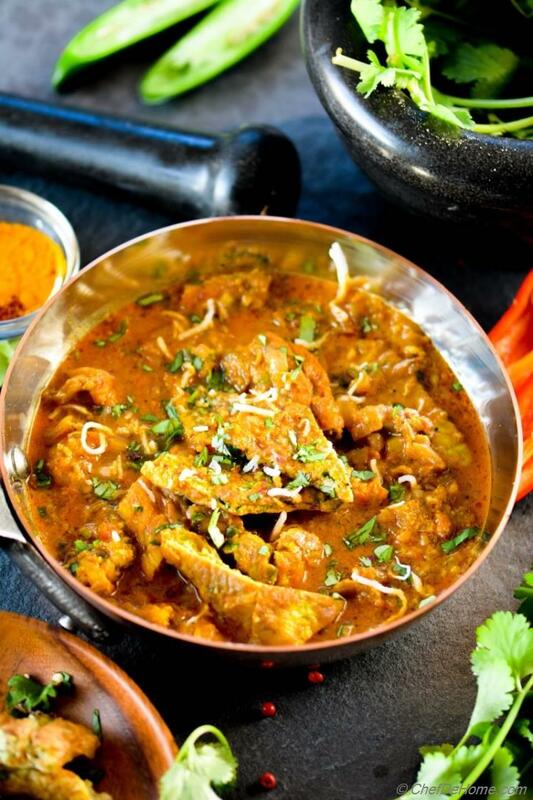 Good news for all my lactose-intolerant friends, this curry is also dairy free. Okay! Now let's get cooking! 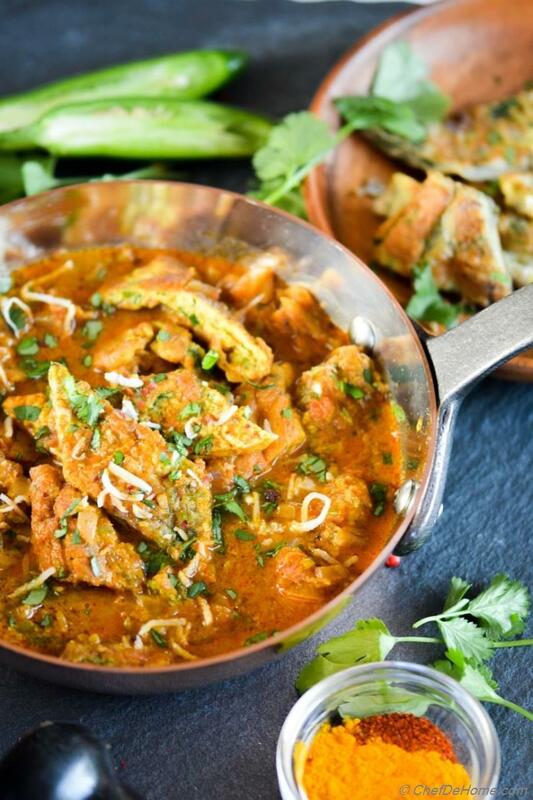 Smart Swap Use Pan-fried Tofu instead eggs for a VEGAN curry! 1. 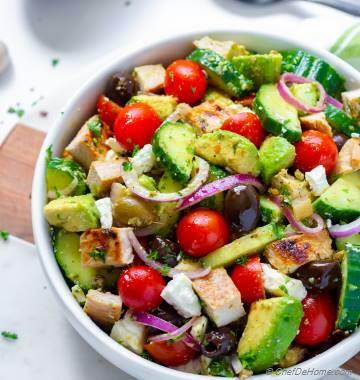 Ready all the ingredients, slice onion, grate tomatoes, chop green pepper and set aside. 2. 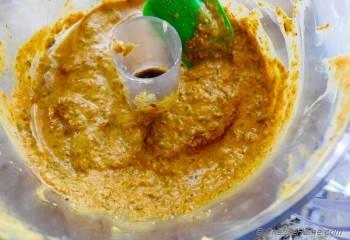 Curry Paste - To make coconut curry paste, combine all ingredients of curry paste in a food processor. If you don't like coconut milk, use equal amount of thick yogurt or cashew cream. 3. 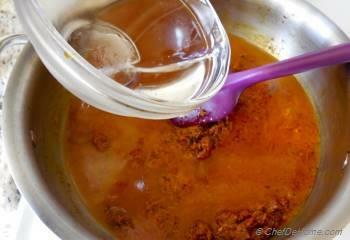 Curry Paste - Pulse, scraping the side once or twice in-between to make a thick paste, use 1 tbsp water (not more) if it is hard to process ingredients properly. Remove from food processor and set aside. 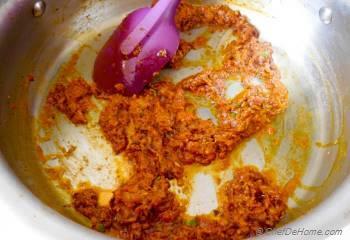 This curry paste will stay good in refrigerator for 1 week. You can also use it to roast chicken. 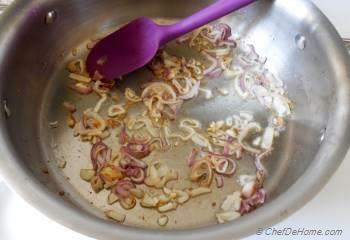 Just one little change, use 1 tbsp oil instead of water (if paste is thick). Thing is, water based products can go bad more quickly. Oil, however, will act like natural preservative. 4. 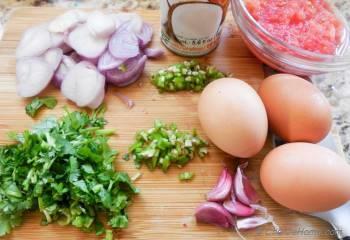 To make Omelet - Beat well eggs and rest of omelet ingredients in a small bowl except oil. Also heat a small skillet with 1 teaspoon to 1/2 tbsp oil. 5. 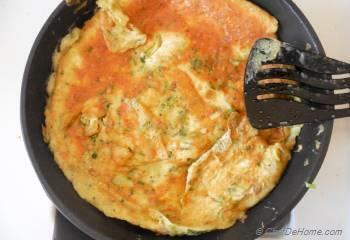 To make Omelet - Add eggs to pan and cook until both sides are brown and crispy! Using wide spatula, flip once bottom side is cooked and set, about 2-3 minutes each side on medium heat. 6. 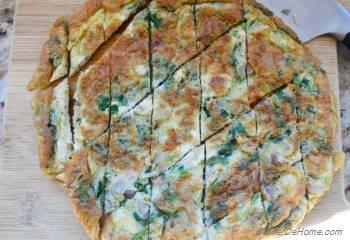 Transfer omelet to a cutting board, using knife slice into strips or diamonds like I did. Set aside. 8. 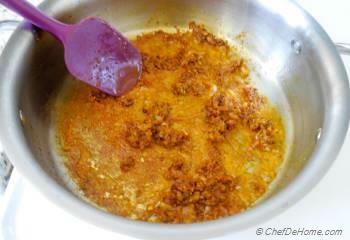 Add curry paste and continue frying stirring often for 4 minutes until spices are nicely cooked. Don't worry about spices sticking to bottom of pan, these will come out once you add tomatoes and water. Just don't let spices turn brown/burn. 9. 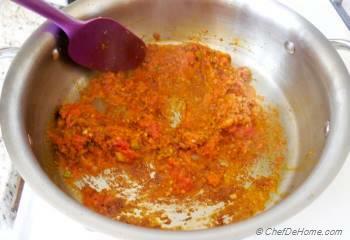 Once spices are nice and toasted, add in tomatoes, green pepper, and 1/4 teaspoon salt. 10. Cook for 5 minutes until tomatoes are fully cooked and mix have started to release oil. Notice, all spices stuck to bottom are releasing now! If not, then add 1 tbsp water. 11. Add 3 cups of water, bring mix to boil then simmer for 10 minutes or until gravy thick to your liking. 12. Once gravy is cooked, taste and adjust salt, then add omelet strips and cook 2-3 minutes (low heat) until omelet is just heated through. 13. 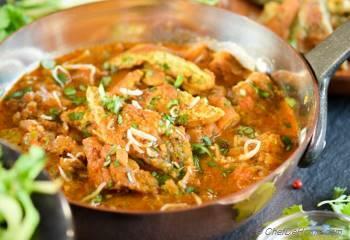 Garnish with fresh cilantro and grated coconut (if you like) and serve hot with rice or roti! Gluten free, omelet egg curry is perfect for an Indian-style, warm and comforting, rice and curry dinner at home! 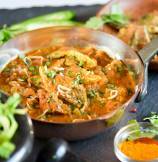 This curry also goes well with Indian naan bread! 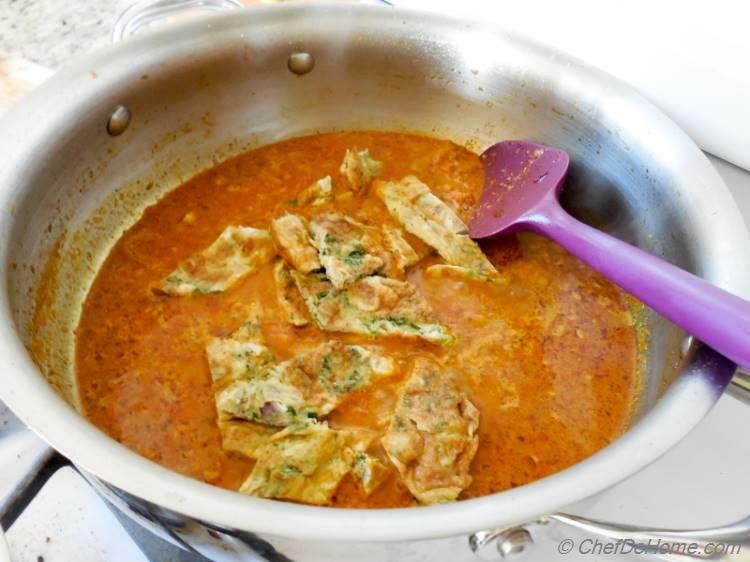 Make Ahead: Egg curry tastes even better when kept refrigerated for 4-8 hrs. So you can make it a night before and serve next day. Or just make curry and freeze for up-to 6 months. 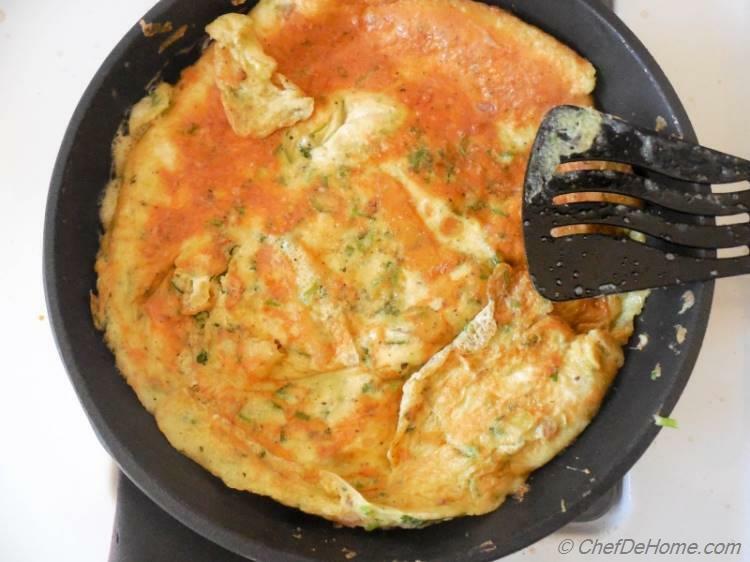 When ready to serve, make omelet or boil eggs and serve hot with steamed rice or bread! 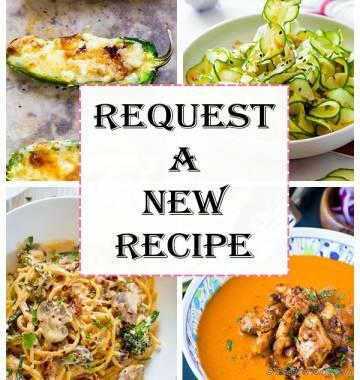 My adapted recipes are never the same as original. So I have tweaked this one too, per my taste and liking. Original recipe calls for 1/2 teaspoon Garam Masala, I didn't feel it need some! Feel free to add for extra spice kick and aroma. One of the best egg curry I have ever tried! thanks! thanks Neeraj! I'm glad you enjoyed it. I like your recipes but they are very difficult to print (I like to have a copy where I am cooking and don't have/want a tablet. This one runs to 3 pages; could you compress them? We are working to roll out a new print feature. It will be far compressed. thanks for your feedback. Awesome. Thank you. I like the fact that you minimised on the garam masala. thanks, Sunil! I'm glad you like egg curry! It really don't need much garam masala, eggs give it ton of flavor on it's own. :) Manali, thank you so much! Omelet does taste great with this curry. loved it! haha I have a similar request when I eat omelet here in US...please make is crispy and it should be well done! we Indians are just not used to eating soft omelets! This looks great Savita, I bet the omelet tastes even better with the curry! 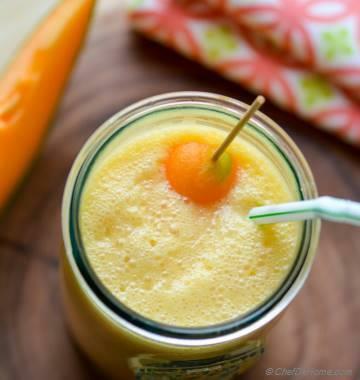 Shalen Ney, you must try it! I'm sure you will love the taste. 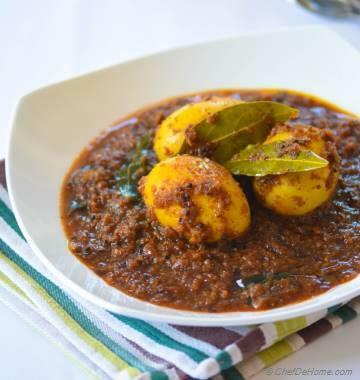 This egg curry is great for Indian rice and curry dinner at home. Neeli Raj, thank you so much! I never tried egg curry.. This looks so good.